Neat Helleholm, and thank you. Where did the lat/long data come from? If so, then stay away from pirates and enjoy the warm weather while it lasts. Northern hemisphere will be a bit chillier by the time Finnmarken gets here. 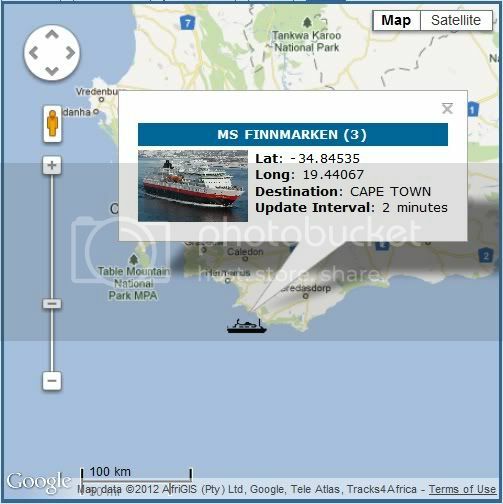 Finnmarken has changed her desitnation to Durban, with ETA 2000 hrs. tonight. She's nearly there! AIS changed again - to 1200 today. Can think of far worse places to spend New Year's Day! She is indeed close to Durban already, with ETA 1200 hrs. UTC. Sorry about the wrong ETA above. My computer is still tuned to S'pore time, hence the ETA was "translated" to that time. Finnmarken has left Durban, bound for Cape Town. Well spotted Carina. She looks brand new again in those photos. Still a long way from home though. Yeah, she looks so new It was posted on Hurtigrutens facebook-page by a "fan". Lots of stuff seems to have been removed. I like the new satellite globe arrangement better than the old one, but I'm curious if she'll get completely new domes like several of the other HRG ships have already have received. Durban, could it have been a bunker & crew change stop or? Could they have used too much fuel from using too high speed compared to what was in the original plan?? They are now due in Cape Town for crew change as planned. Finnmarken has rounded Cape Angulhas a couple of hours ago. Present speed 12.2 kts., which should put her in Cape Town tomorrow morning. Ombugge, I took my eye off the ball and you beat me to it. Last edited by Clipper; January 4th, 2012, 01:50. Finnmarken is at Jackson Wharf, Cape Town. Arrived 0828 hrs. L/T. ETD ?? ?